Your dad is the finest dad on Earth and you have to send the unique presents to him on his unique day. Father’s Day is commemorated throughout the world for paying a compliment to the splendid dads. He is the one who always had a great of faith in you and without whose support you could not have got the success that you’ve got! A dad’s input to the growth of a kid is enormous. You can in no way gauge the love that he has in him for you! By sending Father's Day Gifts to Mumbai you can show your love and admiration for him. There isn’t any such universal standard for the commemoration of Father's Day via Father’s Day gifts on a specific date. It differs amongst the nations. Whereas nations like USA, UK, India, Pakistan, Japan, and more commemorate the event on the 3rd Sunday in the month of June several nations have their own unique dates for the same. From the time of the Middle Ages, a regular day for commemorating fatherhood had been observed on the 19th of March, which is also referred to as St Joseph's Day. Joseph happened to be Jesus' father, and in accordance with Wikipedia, he’s mentioned as the fatherly Nritor Domini in Catholicism and "Jesus’s putative father" in southern European custom. The Portuguese and the Spanish brought this commemoration to the Americans and this was supported by the Catholic Church throughout the later parts of the 14th century to early parts of the 15th century. Actually, it’s noted that this day continues to be commemorated on the 19th of March in Latin America. Even as Father's Day is commemorated on diverse days of the months of March or May across the world, good numbers of nations have presently adopted the contemporary Father's Day on the 3rd Sunday in the month of June. A point to be noted is that the primary Father's Day had been commemorated in 1910, a couple of years following the celebration of the primary Mother's Day. However, Father's Day had been officially proclaimed in the year of 1972 by the US administration. Wikipedia has it that it was in 1966, that Lyndon B. Johnson, the US President, issued the foremost presidential declaration honoring fathers, selecting the 3rd Sunday in the month of June as Father's Day. After Six years, this day was turned into a lasting national holiday with President Nixon signing it into law in the year of 1972. The very old celebration as regards honoring deceased fathers dates a long time back where a celebration of two weeks for celebrating ancestors is done as Pitrupaksha. Despite Father's Day not being the native carnival of India the existing variety of Father's Day has presently gathered pace amongst the people of late. 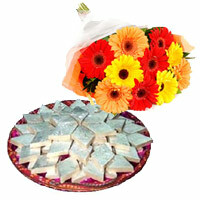 This occasion is observed in Mumbai on the 3rd Sunday in the month of June. This year, the date falls on the 17th of the month of June. Individuals send bouquet of flowers, bouquets and a range of kind of floral displays for their much-loved father for honoring their efforts. Ancient tradition has it that roses happen to be the high-flying Father's Day flowers in Mumbai for the event. Even as a red rose is put on for a living dad, a white rose stands for a dad who has departed this world. 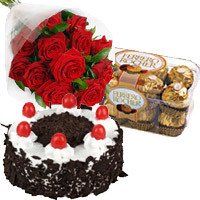 You can also place order for online flower delivery in Mumbai on Father's Day. Leather accessories that include belt, wallet and more stuff are rather popular as Father's Day Gifts to Mumbai. In addition this, there’re present hampers that include personal tidying up kit, a present hamper of cologne, tie, and pocket square, a tie and wallet present hamper, office Father's Day gift hamper, beard grooming kit, and more that shapes the brilliant present option for your dad. If you’re keen on exploring custom-made Father's Day gifts in Mumbai for your dad, you will have difficulty in finding custom-made coffee mugs, custom-made photo frames, custom-made cushions, custom-made table lamps and numerous more things. 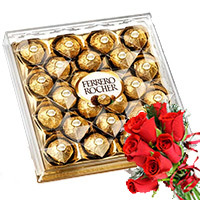 For all those fathers who have a sweet tooth, you are able to send tasty exotic chocolates, chocolate bouquets, snacks gift hamper, and more items from any online gifting site for saving your time and removing the difficulty of handling present items. All of you who are keen on exploring the extensive range of present ideas for this day can surf any of the online gifting stores. There are more than a few top online gift shops, such as Mumbai Online Gifts, that have the most extensive compilation of occasion-specific presents and an enormous set-up of serviceability. They are set once more with a number of brand new Father’s Day Gifts ideas in Mumbai for making your dad feel prized and unique. You can send father’s day flowers all the way to Mumbai at the stroke of midnight for wishing him a joyful father’s day. He is going to be delighted with your passionate idea and is also going to feel proud. You are able to pick an auspicious bamboo plant to present him that is going to bring more good fortune, cheerfulness, and affluence in his life. He is also going to love the range of cupcakes that tenderly says "DAD". It is likely that your dad is seated many miles away in Mumbai and yet with just some clicks, your love for him can get to him safely. While we’re frequently grateful to our mom for everything that she has done for us, how frequently do we recognize and express thanks to our dad? On that being the case with you, you need not worry since as Father's Day is just around the bend and you can use any of the ideas given above and more for making your Father's day a special one.